Is “aid in dying” suicide? The practice whereby terminally ill patients choose to end their own lives painlessly by ingesting a drug prescribed by a physician has commonly been referred to as physician-assisted suicide. There is, however, a strong trend forming that seeks to deny that this act should properly be termed suicide. The purpose of this paper is to examine and reject the view that the term suicide should be abandoned in reference to what has been called physician-assisted suicide. I argue that there are no good conceptual or philosophical reasons to avoid the suicide label. I contend that intending one’s death is essential to the nature of suicide, and this intention is normally required on the part of the terminally ill patient when she knowingly takes a life-ending drug. Additionally, the analysis shows that any plausible strategy that avoids the term suicide is counteracted by the way in which advocates of the practice want to make it legal. 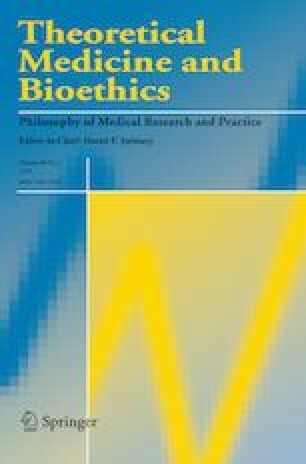 I presented an earlier version of this paper at The Romanell Center for Clinical Ethics and the Philosophy of Medicine Conference, University at Buffalo, July 2016; the Catholic University of America, February 2017; and the American Society for Bioethics and Humanities Annual Conference, Anaheim, CA, October 2018. I’m grateful to the audiences on those occasions for helpful feedback, especially to David Hershenov, Stephen Kershnar, Neil Feit, Jim Delaney, Travis Timmerman, and Eric Mathison. I also thank several anonymous referees for their instructive comments on previous drafts. Caplan, Arthur L. 2015. The case for assisted dying. Chicago Tribune, September 16. http://www.chicagotribune.com/news/opinion/commentary/ct-assisted-dying-california-jerry-brown-perspec-0917-20150916-story.html. Angell, Marcia. 2013. How to die in Massachusetts. New York Review of Books, February 21. https://www.nybooks.com/articles/2013/02/21/how-die-massachusetts. Battin, Margaret Pabst. 2015. Death with dignity: Is it suicide? OUPBlog, Oxford University Press. November 7, 2015. https://blog.oup.com/2015/11/death-with-dignity-suicide. American Association of Suicidology. 2017. Statement of the American Association of Suicidology: “Suicide” is not the same as “physician aid in dying.” http://www.suicidology.org/portals/14/docs/Press%20Release/AAS%20PAD%20Statement%20Approved%2010.30.17%20ed%2010-30-17.pdf. Accessed February 2, 2019. Dworkin, Gerald. 2015. California dying. 3 Quarks Daily (blog). June 1, 2015. https://www.3quarksdaily.com/3quarksdaily/2015/06/california-dying.html. Suicide. 1994. In American heritage dictionary of the English language, 3rd ed. Boston: Houghton Mifflin. https://www.ahdictionary.com/word/search.html?q=suicide. Suicide. 2008. In Merriam-Webster’s collegiate dictionary, 11th ed. Springfield: Merriam-Webster. https://www.merriam-webster.com/dictionary/suicide. Dugan, Andrew. 2015. In U.S., support up for doctor-assisted suicide. Gallup News, May 27. http://www.gallup.com/poll/183425/support-doctor-assisted-suicide.aspx. Newport, Frank. 2015. Americans continue to shift left on key moral issues. Gallup News, May 26. http://www.gallup.com/poll/183413/americans-continue-shift-left-key-moral-issues.aspx. Angell, Marcia. 2012. May doctors help you to die? New York Review of Books, October 11. https://www.nybooks.com/articles/2012/10/11/may-doctors-help-you-die. Cholbi, Michael. 2017. Suicide. In The Stanford encyclopedia of philosophy, Fall 2017 ed, ed. Edward N. Zalta. Stanford: Metaphysics Research Lab, Stanford University. https://plato.stanford.edu/archives/fall2017/entries/suicide. California End of Life Option Act. 2016. California Health and Safety Code § 443 et seq. https://leginfo.legislature.ca.gov/faces/codes_displayText.xhtml?lawCode=HSC&division=1&part=1.85.